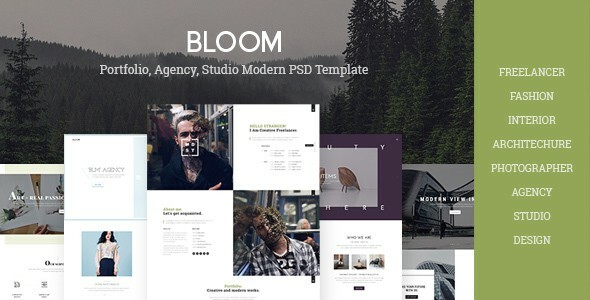 Bloom is minimal & creative psd template which is suit for freelancers, agency, portfolio & photographers. The designed is modern & unique also perfectly organized, so you can easily changes its color, text everything you need. This template can also use for digital agency, architecture, designer, studio, corporate, interior, fashion etc. You will find many uses for this templates. The PSD consists of well-organized components – so it’s easy to modify and customize everything. All elements in groups and can easily identify by the group name as well. PLEASE NOTE: All images are just used for preview purpose only and NOT included in the main PSD files.